Nike To Launch The HyperAdapt 1.0, A Self-Lacing Shoe | OhGizmo! By David Ponce on 03/21/16 • Leave a comment! Only one year after we were promised self-lacing shoes in a movie from the 80’s, Nike seems set to launch the technology in a shoe called HyperAdapt 1.0. Sensors in the heel know when you’ve inserted your foot, and a mechanism will then tighten the laces for you. Buttons then allow you to loosen or tighten further, making it dead simple to get the perfect fit. There’s no more details on the technology, so we’re not sure how long the battery lasts, whether you need to recharge it, etc. 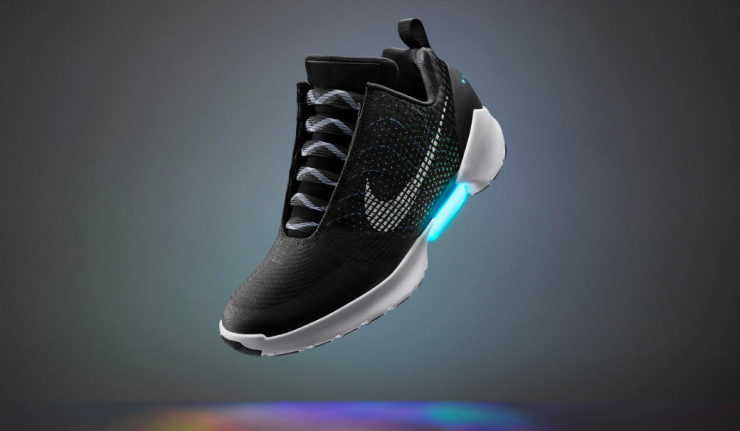 But the point is that self-lacing shoes are here, and the HyperAdapt 1.0 is only the first of many; the company calls it a platform, which they plan to use on other models going forward. It’ll be available ONLY to members of Nike+ beginning Holiday 2016 in three colors, for an undisclosed price.